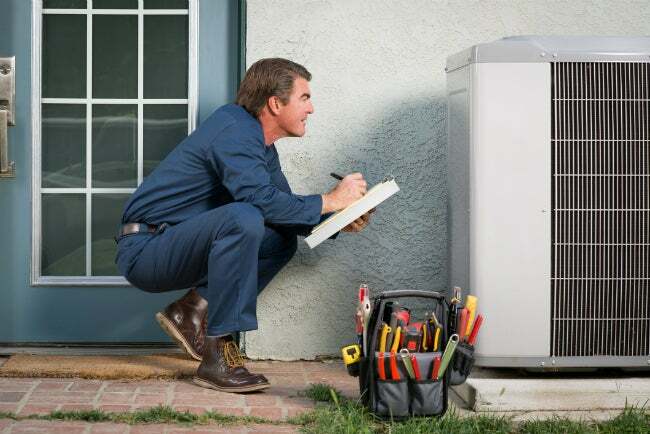 To make sure that you're cooling your house as efficiently as possible, why not call in a pro who can weigh some key considerations and come up with the right size AC unit for your home? Even if your old system seems to be humming right along, it may be worth a review. The U.S. Department of Energy’s Energy Star division recommends having HVAC systems that are 10 years old or older professionally checked to assess their efficiency. Today’s new air-conditioning systems offer much more efficient cooling power than ever before—so long as you select the right size to meet your home’s needs. Air-conditioning systems are rated by the seasonal energy-efficiency rating (SEER) and measured by tonnage. The SEER rating indicates how energy efficient the unit is—the higher the SEER rating, the more efficient the unit. Tonnage, meanwhile, indicates the operational size of the unit. A single AC ton is equivalent to 12,000 Btu per hour (Btu/h), or approximately the amount of coolness emitted by 1 ton of ice melting over the course of one day. 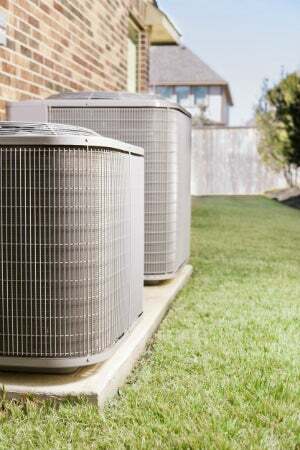 An average 2,500-square-foot home might require a 3.5- to 4.5-ton unit, but there are many variables, and getting the tonnage exactly right is vital to both controlling cooling costs and maintaining comfort. Even though it may run constantly—and run up your energy bill in the process—an undersized AC unit is unlikely to cool a house adequately. It simply doesn’t have the power to do the job. But bigger isn’t always better in the case of a new AC unit, according to Dave Lincon, Director of Product Management and Business Development for Sears Home Services. If an oversized unit cools the air and then shuts off too soon, it never has the opportunity to dry the air effectively, leaving much of the humidity (and general stickiness) unresolved. 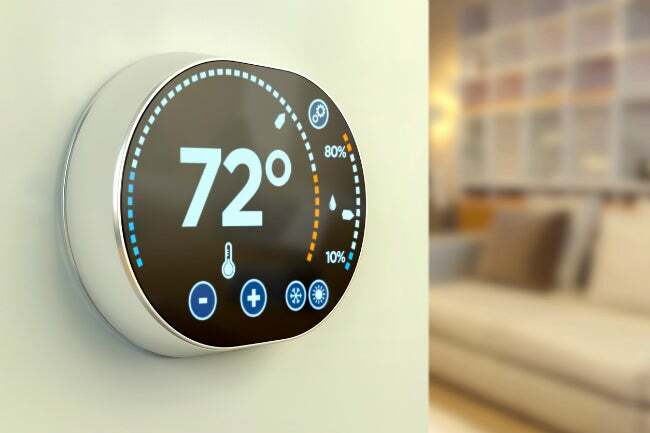 To ensure that homeowners purchase the right size system for their houses, the professionals at Sears Home Services use Manual J (Residential Load Calculation)—a precise formula determined by the Air Conditioning Contractors of America (ACCA)—to compute an individual home’s cooling needs. Nothing is left to speculation. From a home’s floor plan to its geographical location and even its method of construction, all relevant details are analyzed to come up with the correct system size. Among the many variables the formula factors in, the following five may be the most significant for determining the correct tonnage needed for a given house. Your home’s size offers a good starting point for determining cooling needs. During the initial home analysis, Sears Home Service professionals will not only measure your home’s square footage, but they will also measure the height of your ceilings to determine your home’s cubic foot volume. A home with high, vaulted ceilings requires more cooling power than a home with standard 8-foot ceilings. House style is also an important factor. A two-story home and a ranch-style home may have similar square footage, but their cooling needs will differ for a variety of reasons, including the fact that the ranch home could have twice as much roof as the two-story house. “A house in Colorado will have different cooling needs than a similar-size house in Texas or Florida,” Lincon advises. Typically, houses located in hot and humid climates require larger AC systems than houses in cooler, drier regions. And while the prevailing climate in your geographical region is a major component of “location,” the term also encompasses considerations specific to your property: Is your yard full of large trees that offer midday shade? Does your house lack any protection from the harsh rays of the sun? How is your house oriented toward the sun? Windows bring in light and offer wonderful views of the outdoors, but in many homes they’re a source of energy loss, which translates into increased cooling needs. According to Lincon, not only does the number of windows in your home affect the size of the AC system you’ll need, but the type of windows also matters. When performing a Manual J load calculation, Sears Home Services representatives will make note of how many windows your home has, their dimensions, and their type. Single-pane windows are less energy efficient than double-pane, triple-pane, or low-e windows (low-emissivity film-coated windows that reflect the sun’s heat away from your home). The presence of energy-efficient windows can reduce the tonnage requirement. Insulation plays a major role in keeping outdoor heat from penetrating your home on a hot summer’s day. Sears Home Services reps will note both the type and the amount of insulation in your home’s attic and walls. Insulated entry doors will also be taken into account. Most communities have building codes that require a minimum amount of insulation in both walls and ceilings, but older homes that were constructed before the codes went into effect may have inadequate insulation. These older structures could require a larger AC system to keep the home comfortably cool. The type and condition of your home’s current ductwork is another consideration in sizing an AC system. A certified Sears Home Services contractor can connect a new central-air system to existing ductwork, or even install new ductwork if the existing ducting is leaky or poorly situated. If new ductwork is necessary, Sears will install it in accordance with the ACCA’s Manual D (Residential Duct Design) standards. As these may be more stringent than your local building standards, homeowners can rest assured that they’re getting not only the right size AC system, but optimal ducting as well—and new ducting is yet another factor that could reduce the required size of an AC unit. While these five factors are important, they’re far from the whole picture. In using the Manual J formula to determine AC system sizing, Sears Home Service reps will need to gather many other details. For example, Lincon brings up the “human factor,” which includes such variables as the number of residents currently living in the home and the existence of either “hot spots” or spaces that never seem to cool adequately. Even the presence and types of window treatments can be a sizing consideration. As you can see, AC sizing can be a complicated calculation. Certainly, shopping for a new AC system isn’t everyone’s idea of fun, but professionals like those at Sears Home Services can help simplify the task so you can find the right size unit, keep your family comfortable, and maybe even see some savings on your next energy bill.